You work in a company that manufactures technology goods for the public market. Your job entails oversight of product quality and safety, ensuring that the manufactured goods meet or exceed industry standards. Your product line is highly innovative, but other companies are rising fast and challenging your share of the market. Across your industry, a decrease in auditing has led a number of your competitors to compromise on product safety in order to get their goods to market faster and make a quick profit. You are a loyal employee, and the one who could approve a similar safety compromise in your company. Doing so would keep your company on the competitive edge and likely increase its annual earnings. Who knows? You might even get a raise! What values do you consider as you make your decision? Which level of ethical deliberation holds the superior value and finally determines your decision and justifies your action? The first level of ethical reasoning doesn’t really use much reasoning in making a choice. It is called Self-interest, and its primary value is in the pleasure, satisfaction, or advantage it brings to ‘me’ – as quickly and risk-free as possible. As the one faced with this challenge, your interest is the only one that counts. Individuals who make choices and take action on the values of Self-interest typically assume that others are choosing and acting on the same basis. They believe that deepest-down people are looking out for themselves and their own interests. The economist-philosopher Adam Smith put forth the theory that market competition among self-interested actors serves to strengthen and improve the economy, by eliminating those who lack ambition or who produce goods and services of inferior quality or at too high a cost. The next level of ethical deliberation broadens the scope of concern beyond self-interest alone, to include the local groups, teams, classes and organizations in which individuals are members. At this level you understand that social endeavors in which individuals must interact and somehow cooperate for common goals require a set of rules for everyone to follow. The primary value at this level is in the success I can have as a player, employee, member, or citizen in helping my team be its best. We’re used to thinking of Game Rules as the codes for “right” and “wrong” behavior in the field of sports. Each sport has its own set of rules, and anyone who wants to compete and succeed in a given sport must follow the rules. By definition Game Rules are known as conventions – not absolute laws that apply across all of life, but guidelines and consequences invented for the purpose of defining what it means to win and how to play fair. Game Rules can be found across the social landscape – not only in sports and leisure games, but in school, business, and civilian life as well. Your first exposure to Game Rules was likely in your family of origin where you learned how to behave yourself, wait your turn, do your part, and take only your share. Following the rules doesn’t always mean that you get your way. But overall, when your team succeeds, so do you. The philosopher Thomas Hobbes believed that Game Rules, or what he called the Social Contract, are necessary in order to get self-interested individuals to cooperate and not destroy each other. 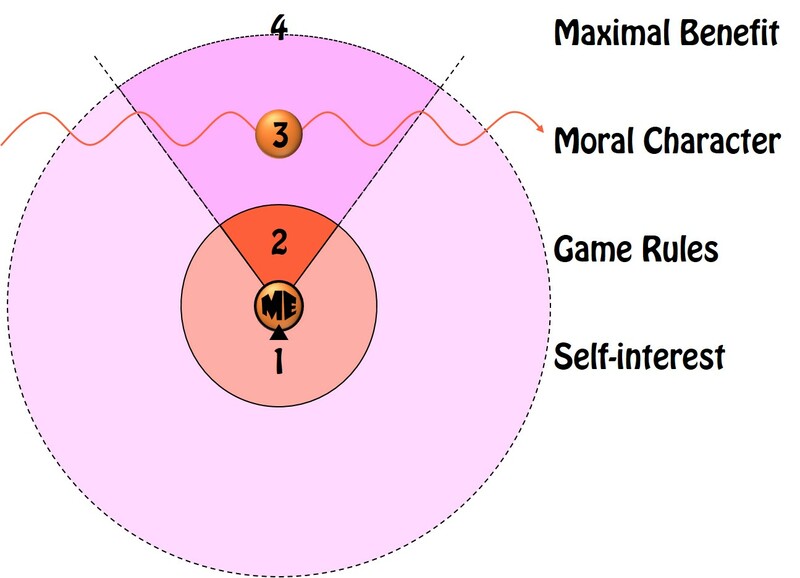 In addition to Self-interest and Game Rules as stages of ethical reasoning, a third level has to do with a standard of Moral Character. The primary value is in keeping my integrity and staying true to the person I want to be. Integrity literally refers to the state of being whole, not falling to pieces or changing your values from one situation to the next, but remaining consistent in your Moral Character. A ‘character’ in story is a figure that may grow and develop as the narrative progresses, but whose core identity is consistent from one scene to the next. 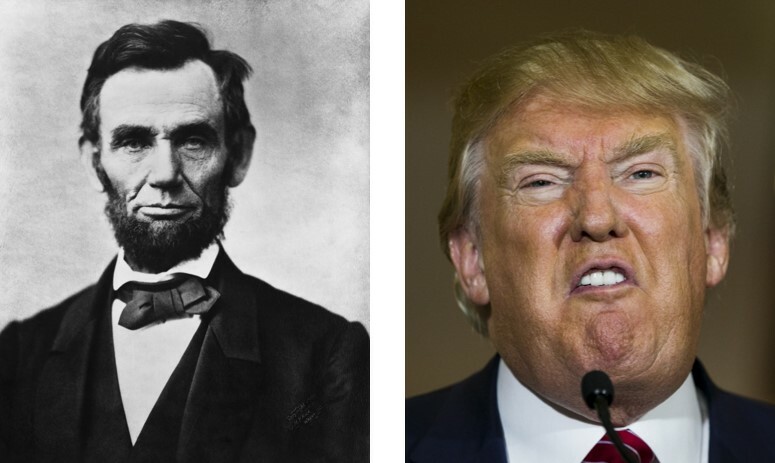 In the same way, Moral Character holds to a standard of self-consistency – presumably as someone who is responsible, trustworthy, and committed to being a ‘good’ person. Understandably, this is also known as Virtue Ethics. At this level, you are less concerned with how others view you than how you see yourself. In fact, an individual may refuse to play by the Game Rules because one or more rules violate moral values that he or she is committed to live by. An example from history is Martin Luther King, Jr., whose belief in racial equality and human rights motivated him to protest by civil disobedience the Game Rules of white privilege. You have probably noticed how each higher level in ethical reasoning holds a larger context in mind. First it’s only you and your Self-interest. Next, you take into consideration the various groups, teams, and organizations you belong to, and the Game Rules that govern behavior inside them. With Moral Character the frame expanded still farther, to take in the longer view of your life and the responsible person you are aspiring to be. So you may be thinking, Is it possible to expand the frame any farther? What else is there beyond me, the groups where I’m a member, and the moral core of who I am? One more level of ethical reasoning invites you to be mindful of everyone, anywhere, who could be impacted by your choices and actions. 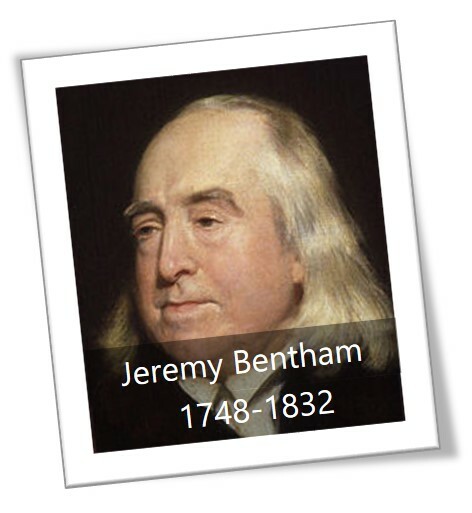 This concern over the ‘utility’ or usefulness of your action in producing consequences that matter is central to Jeremy Bentham’s ethical theory known as Utilitarianism. At the level of Maximal Benefit, the primary value is in contributing to the health, happiness, and well-being of myself and all those affected by my actions. Me, but not only me. The groups, teams, and organizations I belong to, but more than these as well. An aspiration to stay true to my character as a moral being, but going beyond even that. An ethic of Maximal Benefit takes into consideration the fact that nothing is really separate from anything else, and that what we call The Universe is essentially a complex system of relationships between and among countless individuals. Some of these individuals are like you, but a vast majority are very different from you. And yet you and they exist in a web of connections, actions, and consequences. In this diagram, the outer circle and lines projecting from the center are dashed and not solid, to signify an ever-outward expansion. If your action is thought of as a stone tossed into a pond, how far out does the outermost ripple go? If your choices and behaviors are affecting the larger system, what will the consequences be for other forms of life and the generations still to come? Really, how big is the ‘pond’ you live in? Ethical development refers to your growing capacity for acting deliberately within an expanding horizon of values. With ALL OF THAT in mind, what is the best thing to do in a given situation? What action will benefit the maximum number of stakeholders – all those who will be, are likely to be, or one day might be affected? That’s what is meant by Maximal Benefit. An ethic of Self-interest disregards any values that have no obvious and direct gain to you. Your decision will be determined by whether you feel that the personal payoff outweighs the risk of getting caught. If you can get away with it and there’s a chance for a pay-raise, then you will allow the safety compromise without much hesitation. An ethic of Game Rules is most interested in rules and shared expectations governing your behavior. Your decision will be determined by a desire to play fair and help your team succeed. The dilemma is complicated by the fact that other companies competing with you in the bigger game called the Free Market are not playing by the rules. Even though safety standards have been in place for a while, perhaps the times are changing and your company needs to keep up. An ethic of Moral Character strives to stay true to yourself by acting in a way that is consistent with your understanding of a ‘good person’. Your decision will be determined by this inner voice of conscience. One complication here has to do with the matter of whether one’s conscience is inherent to human nature or a product of social upbringing. To the degree that it is learned and reinforced by society, some individuals go into adult life without much of an inner moral compass. An ethic of Maximal Benefit considers what effect your action is likely to have in the bigger picture and longer view of things. Your decision will be determined by a pursuit of greatest well-being. In the case of your decision over product safety standards, a possible salary raise, the competitive advantage of your company, and even whether or not a compromise would break your commitment to moral integrity are secondary to the bigger question of what consequences your decision might have farther out and later on for all concerned.